28 July at 8:30am – Books, cakes, clothes, furniture, toys, plants etc. and all money raised will be to support missionary work. 9:30am Women’s Bible Study · For more information, please contact us. 9.30am Bible Study · At the church with David Whigham. 7pm Bible Study · At the church with Peter Barnes. 7pm Bible Study · For more information, please contact us. 10.30am Women’s Bible Study · For more information, please contact us. 3rd Saturday of each month, 1.30pm. 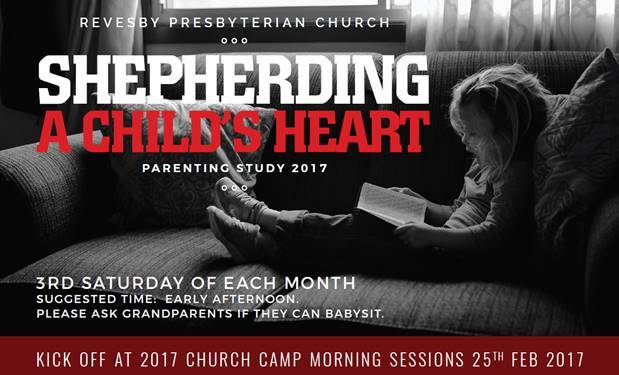 Shepherding a Child’s Heart – Parenting Study. For more information, please contact us or click here to download flyer.